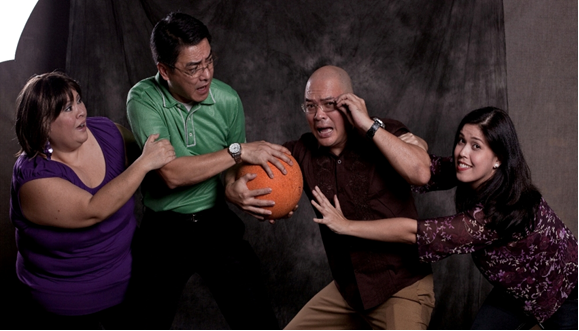 Ever wondered where and when does Ateneo and La Salle's grudge to one another started? Off course to every one who become part of either institutions knows the history but people like us who are outside the fence only knows that they are great rivals on athletics most specifically on NCAA (now UAAP). But behind that is a much deeper story and it will be revealed on The 4th Wall Theater Company's staging of the original Musical: Rivalry. Started as a Toyota vs. Crispa Musical concept by Champoy legend Noel Trinidad 30 years ago, he presented the concept to his friend Ed Gatchalian who is a celebrated musical genius. But due to them being so occupied by work and not to mention the lack of time and resources, the idea didn't materialize. Not until a year ago. 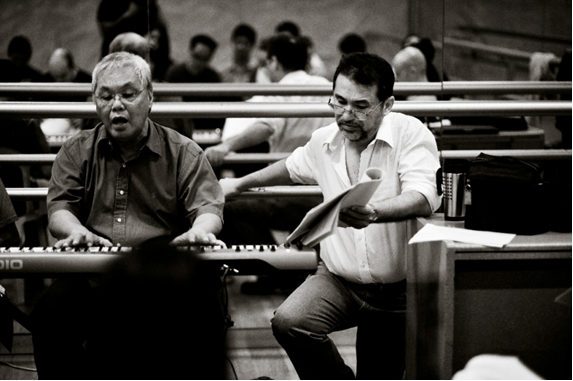 Gatchalian and Del Mundo working the final touches of the Musical. “Last year, some three decades later, when I started writing original music with Jaime del Mundo on '100: A Musical Journey in C Major' for the Insular Life Centennial celebration, it rekindled my desire to pursue Noel’s idea. This time, however, instead of Crispa and Toyota, I decided to zero in on the two arch rivals Ateneo and La Salle,” Gatchalian said. And there that moment Rivalry is born. Above photo shows one of the scenes in the show, showing (l-r) Sheila Francisco, Raymund Concepcion, Juliene Mendoza and Jenny Nuyda-Tatlonghari. At first, many thinks only alumni of both school's could be the sole market of the show. But Gatchalian strongly believes that it will definitely attract more people regardless what school they are from because of the universality of concept not to mention the outsider's growing curiosity over the intriguing fact why are these schools still arch rivals after all of these years. Gatchalian also gave us an assurance that what we are about to see in the show are completely accurate and based on real facts. To be sure of that, he consulted friends from the other side (La Salle, gatchalian is from Ateneo) regarding things that an Atenista will never know. “The story has been in my mind for years because I lived those days. So I had a lot of nice memories and I just kept on putting them together. But when I decided to really be serious about this, the first thing I did was I consulted three friends from La Salle --Juan Miguel Llamas, Tony Cervantes and Jimmy Morelos. Based on their input, I did dummy lyrics. Then I started on the music,” he recounted. 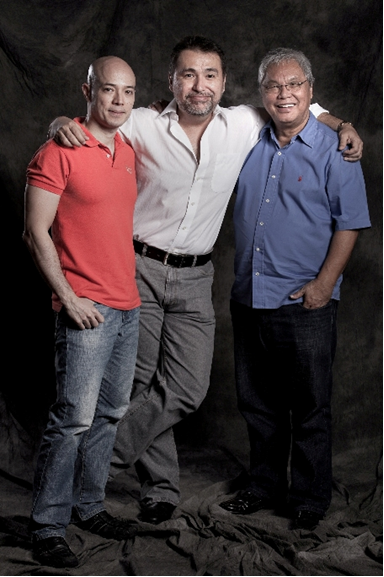 Above photo shows the three men behind “Rivalry: Ateneo-La Salle The Musical” (left to right): Joel Trinidad, lyricist; Jaime del Mundo, book and director, and Ed Gatchalian, executive producer, composer and arranger. Then as the show takes shape, Gatchalian then seek the help of friend Jaime Del Mundo to write the final book and Joel Trinidad to write the music's Lyrics. It is a Powerhouse team that rarely join forces and it did on this one of a kind original musical that we will about to witness tomorrow. 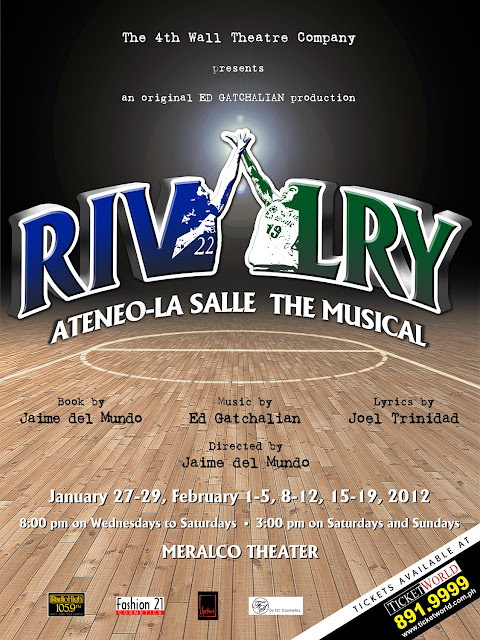 From the Music of Ed Gatchalian, Book of Jaime Del Mundo, Lyrics of Joel Trinidad and Direction by Jaime Del Mundo, Rivalry will open its curtains tomorrow, January 27, 2012 at the Meralco Theater, Pasig City. For tickets login to Ticketworld website or call 8919999. Have you seen it yet? Is it worth watching?